Capella Chocolate Fudge Brownie (V2) Concentrate delivers all the sinfully rich and bittersweet tastes of the classic chocolate brownie recipe. This concentrate is great for all chocolate lovers because now you can indulge your sweet tooth and forget about the calories. 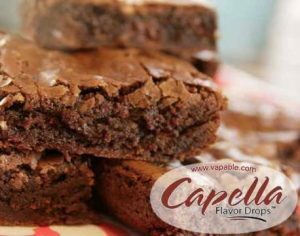 Capella Chocolate Fudge Brownie (V2) Concentrate has a wonderfully rich and dark flavour making it good as a stand-alone, but it is terrific in a mix with other sweet flavours; it combines well with peanut butter, vanilla ice cream or banana for a wonderfully indulgent dessert e-liquid. This is the v2 version, which is diketone (acetoin, diacetyl and acetyl propionyl) free.